The advertising industry of India is undergoing massive growth. The market reached a value of INR 51,000 crore (approximately US$ 8.1 billion) by 2016, recording a CAGR of 11% during 2011-2016. The digital signage for outdoor advertising segment also registered positive growth over the last five years, where verticals such as government and transportation, retail and hospitality witnessed major boost. In India’s digital signage market, indoor applications have recorded major growth owing to a number of installations in areas such as retail outlets, multiplexes, restaurants, pubs and bars and Quick Service Restaurants (QSRs). However, no one seems ready to comment on the exact size of the outdoor advertising industry. Views about the signage industry seemed to vary from those who say it is stagnant to others who claim that it is dynamic and fast growing. Stagnation is attributed to lack of awareness in semi-urban and rural parts of the country. On the other hand, reliable sources say that it is going through a rapid transformation phase and is becoming organized and mature day-by-day. 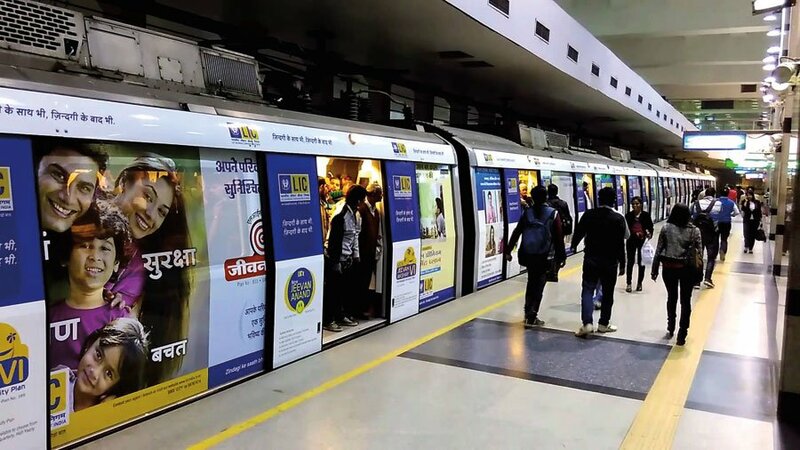 According to a report providing an in-depth analysis of the Indian signage industry, it was noticed that signage has a significant market share in terms of advertising both in value and volume. It also indicated that the current scenario within the industry hints at massive growth opportunities in the future. The manufacturers of signage boards are adapting and upgrading to all the technological advancements including digital and electronic signage. The leading electronic signage suppliers include Samsung and LG. “The Indian signage industry has grown significantly in the past few years. Observing the growth in the market over a decade, there are huge opportunities for improvement in business in the coming years,” says Sandeep Loomba of a leading advertising agency Adwala. However, he too feels that the Indian signage industry is lagging behind the international signage market and the growth of the industry will depend largely on the measures taken by the government in coming days. He also notes that there is a need to use more eco-friendly signage solutions. “Most of the Indian companies are still not using eco-friendly solutions because they are not affordable. It should be kept in mind that the government regulations mandate the use of eco-friendly solutions for the industry and it is imperative that all companies follow these,” he explains. A sizable economy with a high rate of GDP growth, growth in areas of infrastructure, real estate, manufacturing and especially the organized retail sector is immense. “This will definitely accelerate the growth of the Indian signage industry. The advent of global brands and rising consumerism has led to an increase in the demand for quality signage. Though a considerable part of the industry still constitutes solvent-based and flex printing, there is a growing need to shift to UV digital printing and inkjet technology. It is foreseeable that the UV printing trend is going to last for a long time,” says Pradipta Chowdhary, senior product manager – WFIJ, Fujifilm India. The corporates in the market are demanding innovative solutions from print service providers and the ones who are catering to their client’s specific communication and branding needs with imaginative solutions are triumphing over the others. Outdoor signage commands not only a geography but a specific demographic. For instance, Chetan Bhagat is very clear that he wants to sell a large number of his books to ordinary urban young people. For this reason he was able to publicize his most recent title, One Indian Girl, on the Mumbai local trains using digitally printed outdoor signage. Standard flex printing and vinyl printing are not the norm these days. “Offering innovative solutions improves one’s chances to make higher margins and get more business. To sum up, in this era, innovation is the key for all the companies to endure in the market,” comments Ajay Aggrawal, chief executive officer and managing director of Insight Print Communications Pvt. Ltd.